You had a really great week at school. I have to admit that I was a little nervous. Why? Well, Monday was your first day back after Disney World and winter break after that. On Monday, your teacher mentioned that your student teacher was doing her solo week. I cringed at the thought of doing a solo week right after a break. I was proud to hear that you did well this week. After the initial excitement to tell everyone all about Disney World, you settled down (at least I think since nobody called/talked with me). On Tuesday, you were so excited about the assembly for Black History Month. For months, you have been coming home and singing Michael Jackson songs to get ready. I took a bunch of photos and video from and will be sharing more about that later. 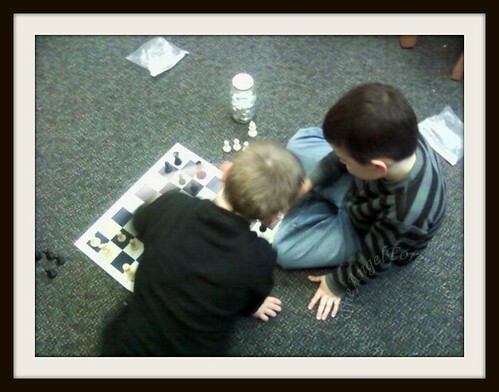 That afternoon, JSL and I went to hang out at Chess Club with you. We figured an extra adult in the room could not hurt. When Chess Club was over, your little brother refused to hold my hand while walking to the car. Thank goodness, you were sweet and volunteered to help out. 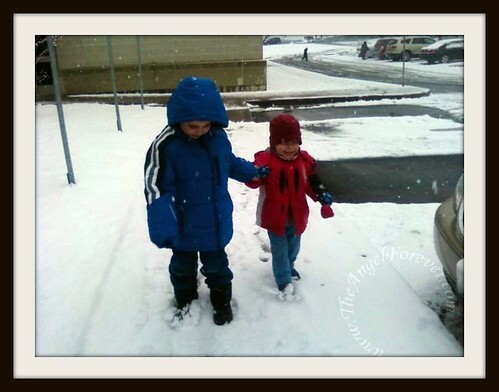 The two of you were so cute walking in the snow that I had to take a photo. Later that night, you turned your PJ top inside-out to rally for a snow day. 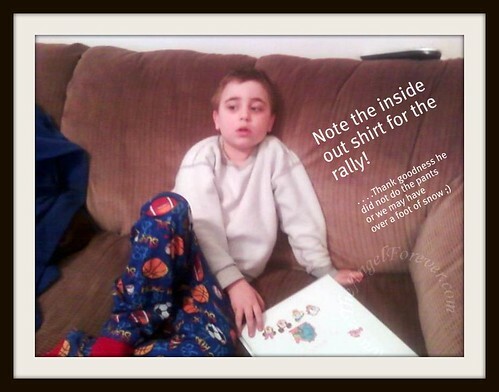 You were quite successful with your first ever attempt at rally PJs. An entire foot of heavy, wet snow fell and closed school for the day. When I went outside to help Daddy shovel, you waited inside in case JSL woke up. When he woke up, you went to him, helped him out of bed and snuggled on the couch with him. You are such a great big brother. The rest of the week went by pretty nicely. Now you are looking forward to seeing Cousin S and your new Baby B. I hope that the weekend as big brother/cousin continues the way the week went. .-= Dorothy Stahlnecker´s last blog ..Share more time with your family it’s healthy =-. Celebrate your boy! He is a wonderful big brother! Gosh doesn’t it just delight your heart when they are this caring and loving! Hope the Weekend is just as sweet. .-= JamericanSpice´s last blog ..Do You Have The Post-Conference Blues? =-.